Preparation: Preheat oven to 400 F. Brown the sausage, drain and set aside. Cut the vegetables and saute them until softened. I add a little water and cover to steam a bit and then uncover and dry out a bit. 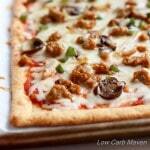 Low Carb Pizza Crust: Place the 5 ounces of grated mozzarella cheese into a medium-sized microwave-safe bowl. Cut the cream cheese into about 6-8 pieces and place in the bowl with the mozzarella. Microwave the cheeses for 1½ -2 minutes depending on the strength of your microwave. Stir the cheeses together. Break the egg into the cheese and stir with a fork until combined. It will take a minute to coax the two to blend. Add the almond flour and protein powder and blend completely. Sometimes I use my hand at the end and knead the dough until it is more elastic than sticky - which is when it is a little cooler. Method: Hands: Place a piece of parchment paper on a sheet pan and with water moistened or oiled hands, pat the dough evenly into place. I prefer to oil my hands. The dough will cover most of the sheet pan. Dock (poke holes all over) with a fork. Bake: Bake on the bottom rack for 8-10 minutes until golden brown. Remove from the oven and rub the crust with a piece of garlic. It will melt into the crust and be wonderful! Spread the marinara sauce over the crust and top with half of the cheese. Add the rest of the topping followed with the rest of the cheese. Place under the broiler for about 5 minutes until it's hot and the cheese has melted. ***Coconut Flour or Oat Fiber 500 can be subbed for the whey protein powder. Coconut flour will result in a faint coconut taste and the Oat fiber can be a little dry, but they are both great. Makes 2 - 10 inch pizzas or 1 large sheet pizza. 1. Nissa says that a flax egg may be used in place of the egg. 2. She also says that no egg is needed as the cheese serves as a sufficient binder.